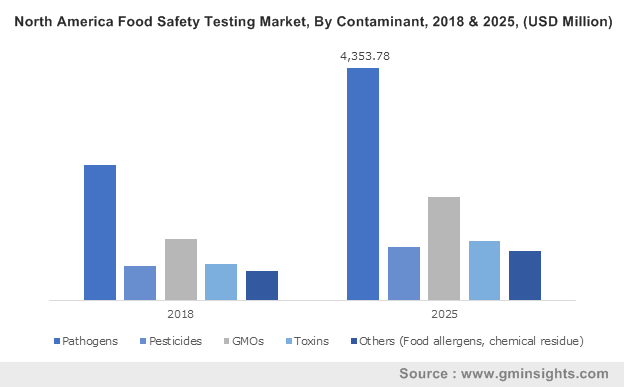 Global Food Safety Testing Market size was worth over USD 14 billion in 2018 and is projected to witness more than 7.5% CAGR from 2019 to 2025. Growing food safety concerns owing to increasing outbreaks of foodborne disease is driving the food safety testing market growth. Rise in consumer awareness about food safety, increase in chemical contamination circumstances, and advancement in rapid inspection are propelling business growth. Also, modification in regulations aimed at reducing the number of people affected by food diseases such as nausea, food poisoning, and diarrhoea is resulting in improved quality of products. To gain profits, processors (sometimes) sells expired or unfit food or intentionally provide misdescription, thus causing infections and diseases, observing the market growth. Factor such as urbanization, increasing disposable income, and economic development has further resulted in strong growth of food & beverages industry. Growing import & exports are resulting in increased contaminant levels due to inadequate control & monitoring is supporting industry share. Additionally, escalating demand for pesticides residue & other contaminants testing for fruits & vegetables accompanied by increasing global fruits & vegetables trade will enhance the industry progress over the forecast timeframe. Increasing adulteration level for enhancing the product shelf life are among the key aspects steering testing demand during imports. Meat, poultry & seafood, fruits & vegetables, and processed products are among the key contributors to the food safety testing market. The global meat production has increased form around 230 million tonnes in 2000 to 320 million tonnes in 2014. Trends in emerging economies towards processed meat and convenience food coupled with government initiatives to reduce the food diseases and business expansion will surge the product development. Increasing competition among service providers has resulted in patent filing of new contaminant detection technologies. Technological advancements towards the development of reliable rapid testing techniques are propelling the food safety testing business growth. An increasing number of patents launched on rapid technologies such as real-time PCR and immunosorbent assay techniques display strong growth potential for the next years. The industry observes, innovations focused on reduced time for obtaining test results along with improved accuracy. Globally, supply and quality of food are under constant risk, which has resulted in increasing demand for effective test products that certify safety. This is due to food processors skip routine food inspections to reduce their operating costs, hampering the industry growth. Also, lenient laws and lower penalties on food contamination in developing countries can limit the industry growth. Though, rising concerns among consumers has urged the government to take measures such as increasing inspection levels for reducing the food contamination and disease spreads. Further, higher cost of rapid technology can influence the adoption rates for the next few years. Pathogen contaminants dominated the global food safety testing market, accounting at over USD 6 billion in 2018. Pathogens testing is majorly carried out for meat, poultry, seafood, and dairy products. High applicability in diverse segments along with a high count of patients observing illness caused by pathogens is fuelling the business growth. Salmonella holds a major share in pathogens food safety testing. Pathogens can cause diseases such as diarrhea, vomiting, abdominal cramps, nausea, and prolonged illness can result in deaths. Food safety testing market from genetically modified organisms (GMOs) is projected to witness around 7.5% CAGR from 2019 to 2025. Changing government regulations on GMO labeling will boost the industry growth. Around 175 million hectares of genetically modified crops are grown in more than 25 countries, with U.S. leading the global production. Developing regulations on GMO’s, requiring manufacturers to disclose the GMO’s in their products, will create new growth opportunities over the forecast timeframe. 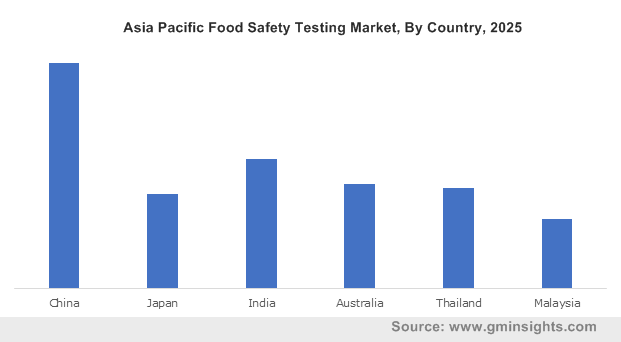 Traditional technology dominates the global food safety testing market, methods are widely used in developing countries of Asia Pacific, Latin America, and Middle East & Africa. Low cost of the product along with a higher count of service providers using conventional methods is resulting in increasing adoption of food safety testing services. Rapid inspection technology is projected to witness over 7.5% CAGR up to 2025. Immunoassay and PCR techniques hold a significant share of rapid technologies. Technological upgrades for providing accurate results in limited timespan will drive the rapid technology market growth. Increasing testing kit launches with competitive prices will boost the industry share. Meat, poultry, & seafood is projected to hold a major share reaching over USD 7 billion in 2025. The global meat consumption has significantly increased to over 42 kg per capita owing to health benefits such as improved protein intake and rise in spending on outdoor dinners. Necessity to maintain or improve the product quality owing to increasing consumer awareness & health consciousness is driving the food safety testing demand. Developing regulations owing to increasing food pathogen outbreaks through meat, poultry, and seafood products will augment business advancement. North America accounted for around 39% of the global food safety testing market in 2018. Inclination towards rapid methods owing to technological advancements and high competitiveness in the region will propel the business expansion. Further, innovations such as real-time PCR or quantitative PCR will upsurge industry advancement. Regional pricing difference along with increasing demand for instrument-based testing has surged the market share. Developing regulations on genetically modified organisms will support industry growth over the projected timeline. Further, safety testing at multiple production stages has positively influenced the business development. Asia Pacific is projected to witness the fastest growth at over 8.0% from 2019 to 2025. Strong growth in F&B industry supported by enhanced focused on food safety will drive the market expansion. Asia Pacific food & beverages market is projected to witness 7.5% CAGR over the next few years owing to economic development, population growth, improvement in standard of living, and increasing consumer spending on foods, and influence of western trends. Countries including China, India, Japan, and Thailand are the largest F&B markets in the region. Robust growth in meat production along with trends towards processed food owing to lifestyle changes will positively influence the industry development. Asia pacific accounts for over 40% of the global meat production, and Australia observes the highest per capita meat consumption on a global level. 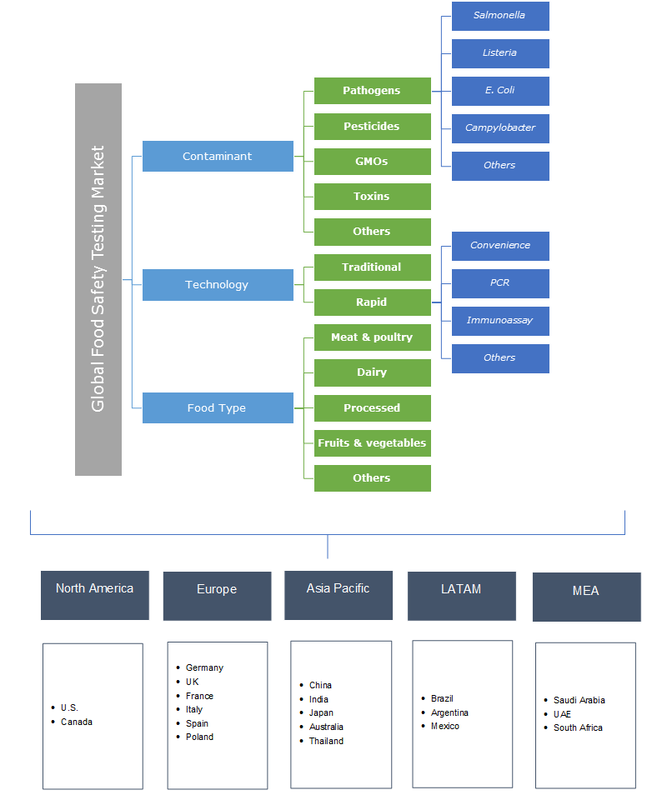 Europe holds a substantial share in the global food safety testing market. Countries including Germany, France, the UK, Italy, and Spain are the major contributors to the regional demand. Higher preference for ready-to-eat and processed food, and meat products is among the key factors augmenting market growth. Europe observes a high volume-to-population ratio for food testing owing to increasing health concerns and government focus on reducing the impact of foodborne diseases. Further, consumer preferences towards organic fruits will support business expansion. 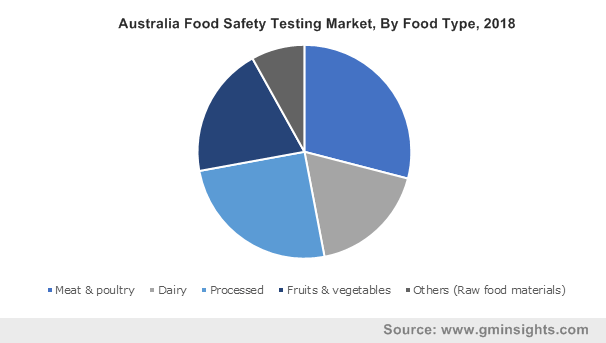 The global food safety testing market is moderately fragmented owing to the presence of many regional service providers & multinational players. Companies including Bureau Veritas S.A., Bio-Rad Laboratories, ALS Limited, Neogen Corporation, and Intertek Group PLC are among the key players in the market. The foremost strategies observed among the major players in the industry include geographic expansions and strategic acquisitions to enhance the business revenues and market share. For instance, in August 2018, ALS Limited acquired Truesdail Laboratories to expand its U.S. life sciences business. The global food safety testing market is highly inclined towards updates in disease outbreaks, government regulations, and technological developments. Increasing occurrence of foodborne disease has prompted several countries to modify their regulations. More than 200 foodborne diseases are caused by micro-organisms and chemicals. Pathogen outbreaks and consumer awareness on food contamination due to pesticides will fuel the services demand. As per the U.S. Center for Disease Control and Prevention, in 2018, the country observed several salmonella outbreaks from products such as eggs, beef, chicken, and coconut.